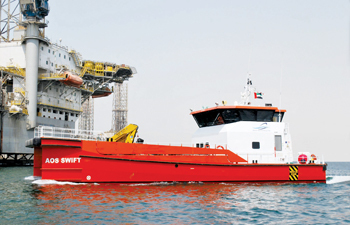 UAE-based Atlantic Maritime Group (AMG), a provider of marine logistic services, ship repair, fabrication and other marine services, has imported a Fast Crew Supplier (FCS) 2610 workboat, named AOS Swift, from Damen Shipyards Group. The Middle East will see the first Damen Twin Axe vessel being used for safe passenger and crew transfer as well as for the transport of industrial persons, materials and equipment to unmanned offshore platforms in the Strait of Hormuz, said a statement from the company. Damen Shipyards customised, commissioned and delivered the vessel within three months, transporting it from its Gorinchem yard, Damen said. The company had signed the contract with AMG in the UAE on June 1, and the vessel will be chartered to a Norwegian oil and gas company for its platform operations Offshore Oman, it added. AMG ordered this workboat due to its reliability in rough water conditions with a high operational speed of 25 knots maximum, said Damen. Around 35 industrial persons are transported to and from the platform daily, and although there is a heliport on the platform, it is much more efficient and comparatively less costly to carry out transportation of personnel by sea, it said. The 25.75-metre-long workboat’s twin hull design features robust fendering, a gas detection device and extra air-conditioning units appropriate for the Middle East climate. Additionally, the FCS workboat is equipped with an additional hydraulically-operated 2,200 kg crane with a reach of 8.6 m. There is deck space for two 20 ft containers as well as a GPS Plot self-managed man overboard system and a Jason cradle for emergency personnel recovery. The workboat houses a total of 35 passengers plus crew, with accommodation ideally situated at the aft of the vessel for comfort.